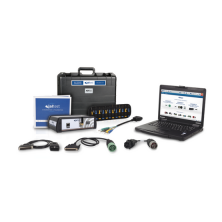 Jaltest Commercial Vehicle Diagnostic Package provides the most comprehensive truck software on the market. It is the premier software on the market. Used with Jaltest Info Online (included with this package) you’ve unleashed an incredibly powerful diagnostic tool. Fast connection & code retrieval, place the cursor on the fault code & you’ll get a drop-down box with the troubleshooting procedure along with pictures of the faulty device showing pin testing & test parameters. Need wire diagrams? It’s built into Jaltest Info Online. Diagnostics made easy. Minimize downtime, maximize profits, go Jaltest! This is your single shop solution for performing diagnostics on the commercial vehicles. Whether diagnosing tractors, straight trucks, trailers or reefers, Jaltest has you covered. Jaltest commercial vehicle software will help reduce diagnostic & repair time, increasing productivity & profits. Replaces the need for OEM and aftermarket software requirements for class 3-8 covering (and most class 1-2) over 100 vehicle and component manufacturers. Keeps it simple for you & your technicians. Requires only a single annual renewal. Rather than renewing multiple pieces of software, why not just renew one? Hundreds of Thousands of Technical Specifications. It has the same user interface, navigation and functionality regardless of vehicle or components. Includes the software to diagnose reefer units & trailer ABS. Provides diagnostic reports that can be registered to your customers and accessed by your management via a cloud-based storage system. Eliminates the need of technical support and procurement services associated the OEM software requirements experienced by your technicians’ current diagnostic platform, saving a tremendous amount of upfront and ongoing costs.